Location: Burmese rock pythons are found across northern India and southern Nepal while the Indian rock python is found further south, in peninsular India, Pakistan and Sri Lanka. The large python of South Asia is the Asiatic rock python, Python molurus. Two subspecies exist, the Indian rock python, Python molurus molurus, which is confined to Pakistan, peninsula India and Sri Lanka (the former Sri Lankan subspecies Python molurus pimbura is no longer considered a valid subspecies), and the Burmese rock python, Python molurus bivittatus, which, as its name suggests, comes from S.E.Asia where it is over-shadowed in size by the Reticulated Python, Python reticulatus (see 3:3 Siamese Crocodile). The Indian and Burmese pythons appear very similar but with a little experience it is possible to tell them apart. The Indian python has a pale cream-grey ground colour while the Burmese is a more yellow-light brown. The dark lance-shaped marking on the top of the head is also more apparent in the Burmese than in the Indian but these colouration details can be variable and unreliable, especially in a wide-ranging species like the Asiatic rock python. However, there is one very good character that can be checked. The enlarged scales along the upper lips are known as ‘supralabials’ and the 6th and 7th supralabials are positioned directly under the eye. In the Indian rock python the 7th supralabial is actually in contact with the eye but in the Burmese rock python one or two small scales beneath the eye, known as ‘suboculars’, prevent contact of the supralabial with the eye. 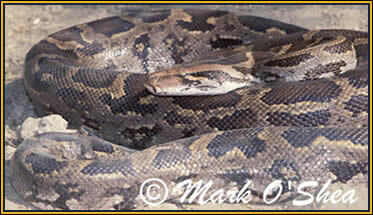 It was this characteristic that Mark O’Shea observed in three large pythons he caught in western Nepal in 1992. He expected to find Indian pythons but he caught three Burmese pythons. The accepted idea that the Burmese python was S.E.Asian and the Indian python was S.Asian was clearly not true. Burmese pythons were present in the Indian subcontinent but this raised a host of questions. 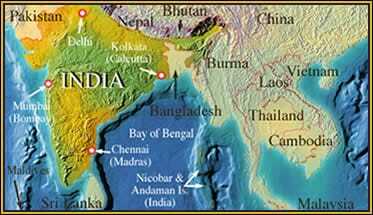 Did they live alongside their Indian relatives, sharing habitats and resources, did they interbreed, how had they become separated in the past to evolve into two subspecies if they occurred alongside one another ? Ten years later Mark is back trying to find answers to some of these questions. He tracks down pythons across the width of northern India starting in arid Rajasthan, in Indian python territory with India’s top python expert and the only person studying them in the wild, Dr Subramanian Bhupathy (Salim Ali Centre for Ornithology). As Mark moves eastwards to wetter conditions in West Bengal he encounters his old friend the Burmese rock python. The two pythons certainly seem to prefer different habitats, the Indian being found in dry woodland locations and the Burmese living in wetter grassland habitats further north and east. Another aspect of python ecology Mark wants to investigate is their amazing physiology. Pythons, as everybody knows, eat large meals, very large meals, infrequently, and their metabolism and anatomy has to be able to adjust. It has recently been discovered that between meals python internal organs shrink down to almost nothing and then recover after a large meal. Also when they are feeding and digesting their metabolic rate is said to increase to forty times its resting speed. That is a greater gear shift than that experienced by a galloping racehorse. It would seem that extended periods of inactivity and fasting are essential components in the natural biology of this large predator. Pythons are not the only large animals to be found in India and Mark meets leopards, rhinos, gaur bison, elephants and sloth bears on this quest. Leopards and sloth bears are particularly dangerous, probably more dangerous to local people than tigers. Leopards are used to man and understanding his ways, they take advantage of him. Sloth bears are short-sighted and they panic, killing or maiming the people they encounter in the process. Mark meets victims of both sloth bear and leopard attacks and if you think the wounds are unpleasant you should see the ones we did not screen. Mark spends several cold nights out watching for sloth bears using an image-intensifier. Riding elephants is always a pleasure for Mark but probably the strangest experience was riding an elephant through the crowded traffic-clogged streets of Jaipur, Rajasthan. We also visited locations on the Chambl River, Madhya Pradesh, to film slender-snouted gharials but that footage failed to make the final film. An Indian rock python (Python molurus molurus) in Keoladeo National Park, note the pale grey ground colour.